In 2011, cartoonists Tom Hart and Leela Corman experienced the worst horror any parent could ever face when their daughter Rosalie unexpectedly passed away before her 2nd birthday. Hart is known for whimsical comics like Hutch Owen and his loving depiction of the early days of parenthood in the webcomic Daddy Lightning (later collected into book form by Retrofit Press), which he was still working on when Rosalie died. Losing their child has understandably taken a great toll on Hart and Corman, and both have taken to cartooning as a coping mechanism for making sense of this tragedy. I’ve previously written about one of Corman’s cartoons here, and Hart has been publicly working through his grief in a webcomic called Rosalie Lightning, now collected as a graphic novel from St. Martin’s Press. This is obviously a deeply personal journey for Hart and one that he bravely allows us to look in on. Unlike most graphic novels, it doesn’t even read as if it is made for a reader. The narrative jumps back and forth between memories of Rosalie and the days, weeks, and months after her death, as he and his wife try to imagine how to go on without their child. This is a gut-wrenching account of a young family who must find some way to keep going. Those who have suffered loss in their life may find solace in Hart’s depiction of his own, while most parents will want to take frequent breaks to go hug their little ones tightly. Like many of DC’s Digital First books, it is set outside the continuity of the main Wonder Woman comic and, similar to the upcoming Wonder Woman: Earth One graphic novel by Grant Morrison, it’s an attempt at a new origin story. Otherwise, this is a very different Wonder Woman comic in some pretty significant ways. Legend is written and drawn by Renae De Liz (her husband, Ray Dillon, provides inks and colors). De Liz is somewhat atypical of the usual stable of DC creators. She made her name by publishing Womanthology, an early Kickstarter comics success story that showcased female creators from both inside and outside the mainstream comics market. She brings a tween-girl-friendly look and feel to Wonder Woman, one we've rarely seen in the character's 75-year history. The series begins with Diana as a young girl, struggling against the complacency that has fallen over the Amazonian island of Themyscira after centuries of peace and prosperity. There is a lurking danger that only she seems to sense, and her desire to become a warrior is causing conflict with her mother, Queen Hippolyta, who just wants to shelter and protect her only child. It’s a story that hits beats that feel at home in popular young adult fantasy fiction, and it seems to succeed at making Wonder Woman relatable, something that has been notoriously unachievable for many comic creators. Marvel’s Secret Wars mini-series has been a great and almost extreme example of long-form storytelling. I’m not referring to how it takes its name from a famous 1984 mini-series, nor am I making a joke about how this ninth and final issue is way behind schedule. I’m talking about the two things that have made this series one of Marvel’s biggest and most audacious crossover events ever. One is how well-coordinated the many Secret Wars tie-ins have been. There was an intense level of world-building done in developing the patchwork planet of Battleworld, fused together by a nearly-omnipotent Doctor Doom as a way of salvaging disparate pieces of the destroyed multiverse. Although the tie-in stories themselves are relatively self-contained, they do a surprisingly good job of finding small ways to connect and share certain elements (like the planet’s police force of hammer-wielding Thors, or its Game of Thrones-inspired wall separating civilized sectors from the wastelands to the south. If you were able to read even a handful of the 50 mini-series that were published (this great article will help you decide which ones to try), you got a legitimate sense of what Battleworld and its Doom-inspired fiefdoms were all about. Then there is the fact that Secret Wars is actually the finale of one huge story that writer Jonathan Hickman has been building for his whole career at Marvel. It’s the culmination of his epic 44-issue run on Avengers and his concurrent 33-issue run on New Avengers that began in 2013. But it even plays off story elements and character relationships that he set up way back during his run on Fantastic Four and its companion series, FF, from 2009-2012, as well as his stint on The Ultimates from 2011-2012 (which wasn’t even connected to regular Marvel continuity at the time but still converges with this series). Hickman seemed to have planted seeds for Secret Wars years ago, but everything he’s done may be judged by this final issue. It’s a little hard to synopsize Caitlin Skaalrud’s Houses of the Holy because, well, I’m not even sure exactly what is going on it—but I love it just the same. 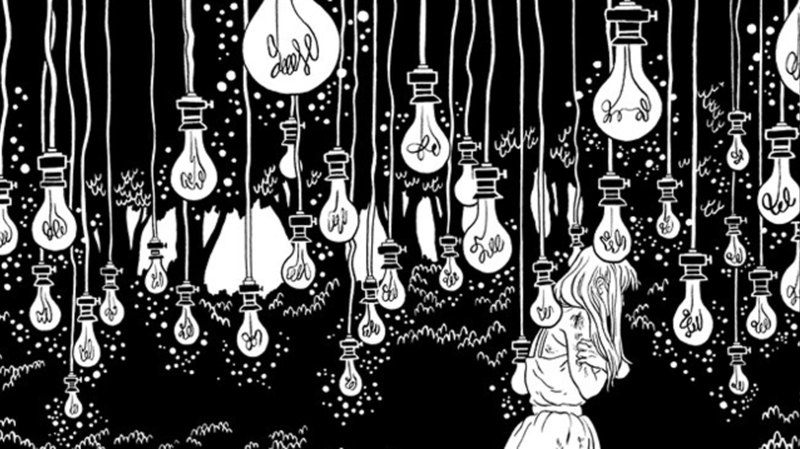 Sometimes, it's the visual wonder that matters most, and Skaalrud has created a comic that reads like an illustrated poem full of iconic and enigmatic imagery. For example, many scenes are set inside a tiny room with three walls that act like triptych panels in the background, making it seem like you’re observing a series of disturbing art installations, or maybe a music video directed by Tarsem Singh and Joel-Peter Witkin. The story could be read as a meditation on depression, and it follows a young woman’s journey through a Dantean landscape of forests, tiny rooms, wide rivers, and tiny bell jars in order to reach the depths of her own psyche. Skaalrud uses large panels—sometimes only one per page—and minimal dialogue so you can immerse yourself in her carefully inked drawings. I’ve written often about all the great comic book options for early readers, and now it seems that Sesame Street has added some options for those readers and their parents. This month, they’ve made a bundle of comics available digitally through Amazon, iTunes, and Google books. Interestingly, each issue contains a “How to Read a Comic” page that helps introduce the concepts of panels, sound effects, other important aspects of comic reading (not to mention some digital specific stuff like swipes and zooms). Sesame Street tends to appeal to kids younger than the typical age for reading comics, but with the way they appeal to grown-up senses of humor (like the Walking Dead parody above), these books can be a good set of comics for parents to sit and read with their pre-schoolers.